Interest in witchcraft, magic, and the occult is strong, fueled by popular books and movies such as the Harry Potter series. Wicca as a religion has exploded in popularity in recent years, leading to a boom in books and products pertaining to spells, witchcraft, and the Wiccan lifestyle. Though witchcraft has a long history both in folklore and in practice, the truth about it has often been obscured by fiction and myth. 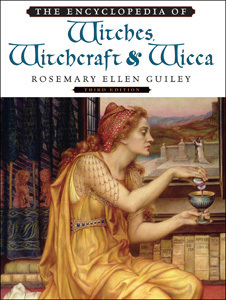 In more than 480 entries, The Encyclopedia of Witches, Witchcraft, and Wicca, Third Edition is an exciting update to one of the landmark references on the subject—by paranormal expert Rosemary Ellen Guiley. This edition provides unparalleled coverage of witchcraft practices around the world—spanning different time periods and societies—including entries on magic, shamanism, the occult, and wizardry. Now covering Wicca-related material not included in the previous editions as well as updates of contemporary biographies and Wicca material, this encyclopedia is perfect for casual readers and researchers, as well as those fascinated by this spellbinding topic. All content has been expanded considerably, providing updates and new information about the key topics of witchcraft. Witches in entertainment: films, television, stage, and popular fiction. "An impressive and definitive compilation of information...strongly recommended..."
"...useful and fascinating...offers a great deal of useful and compelling information."